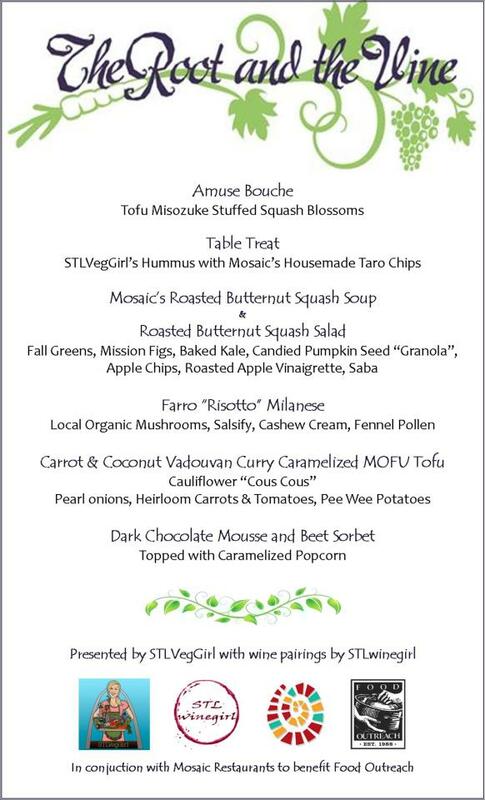 Two of my favorite foodies, STLwinegirl (Angela Ortmann) and STLVegGirl (Caryn Dugan), got together to host the first vegan wine dinner in 12 years, with Mosaic’s Chef Ben Lester preparing all the courses. While I am not a vegetarian, much less a vegan, I have enjoyed taking several STLVegGirl classes since the emphasis is on healthy eating, which is something I strongly believe in regardless if you do it through a plant-based diet or not. Rarely do you find “gourmet” vegetarian or vegan-based dishes while dining out either, so this was a very special occasion for those who do follow a restricted diet. In addition, the dinner raised over $1,800 for Food Outreach from ticket sales. 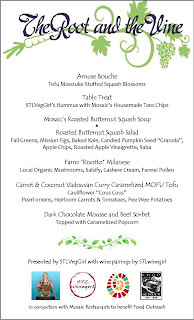 This was probably one of the longest dinners I have been to since we started with an Amuse Bouche of Tofu Misozuke Stuff Squash Blossoms as well as STLVegGirl’s very own hummus that she makes herself. The table was quite crowded with plates and glasses at this point and I managed to finish off the hummus all by myself! Of course these starters were well paired with a sparkling Tomassi Prosecco from Italy. 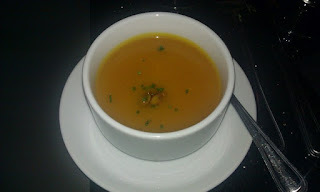 What really filled me up was the official first course, a Roasted Butternut Squash Soup that was actually sweet instead of the usual heavy, vegetable flavor. 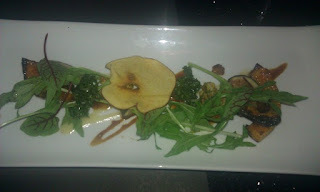 The sweetness continued with the Roasted Butternut Squash Salad, but I mostly tasted the apple chips and apple vinaigrette. The baked kale and candied pumpkin seed “granola” gave the salad additional crunch. They would have made tasty snacks by themselves! This was paired with a Chaumette Chardonel Reserve, from Missouri. The white wine had just enough body to handle the sweetness of the soup and salad. The meal got heavier from there because next was a Farro “Risotto” Milanese made of local organic mushroom, salsify, cashew cream, and fennel pollen. 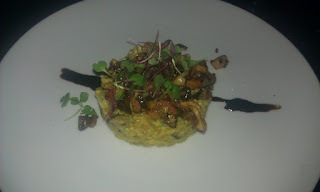 The heavy "cream" and mushroom risotto was perfect for a rainy, fall night and the Siduri Pinot Noir, from Willamette Valley Oregon, was an even match with the course to help cut through the cream. I still had a little bit of wine left, which I really wanted to finish off, but unfortunately, the restaurant must have run out of wine glasses because I didn’t finish in time to get the next wine. The Spanish Juan Gil Monastrell probably was a full-bodied wine because you would have needed a strong flavor with the Carrot & Coconut Vadouvan Curry Caramelized Mofu Tofu. That’s right, locally grown tofu created by Daniel Brewer and his Mofu Soy Beanery. I usually pass on curry while at Indian restaurants because I’m nervous about the amount of heat, but I really enjoyed the strong coconut flavor. 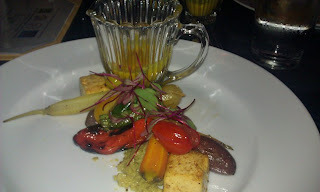 The curry included cauliflower “cous cous”, pearl onions, heirloom carrots and tomatoes, and pee wee potatoes, in addition to the cubes of tofu. I have to admit…the tofu did well to soak up the curry but I just wish it wasn’t in those odd cubes. As much as I loved the butternut squash soup and the mushroom “risotto”, the highlight of the evening was STLVegGirl’s Dark Chocolate Mousse made with avocado. The dessert also came with a beet sorbet, which I’m still not sure if I liked it or not. It was definitely a refreshing flavor to help tame down the richness and creaminess of the chocolate, so they went well together in the same bite. But really, the chocolate was not overly rich like usual since the avocado tamed down the flavor. But for those vegans who enjoy their chocolate, this is a recipe you must get. This was also my favorite pairing of the nigh tsince the “Novy “Oley” Late Harvest Viognier, from California, was actually not overly sweet. This was actually quaffable by itself for sweet wine lovers like myself. Overall, an amazing and creative meal for a good cause and I hope there will be another one in the near future…perhaps with another restaurant?